WARNING: This product can expose you to chemicals including Di(2-ethylhexyl)phthalate (DEHP), Diisononyl phthalate (DINP), Styrene and Lead, which are known to the State of California to cause cancer, and Bisphenol A (BPA), Di(2-ethylhexyl)phthalate (DEHP) and Lead, which are known to cause birth defects or other reproductive harm. For more information go to www.P65Warnings.ca.gov. We've put together this complete recording package to make it easy for you to get all the components you need at a price that's affordable for musicians of all levels. 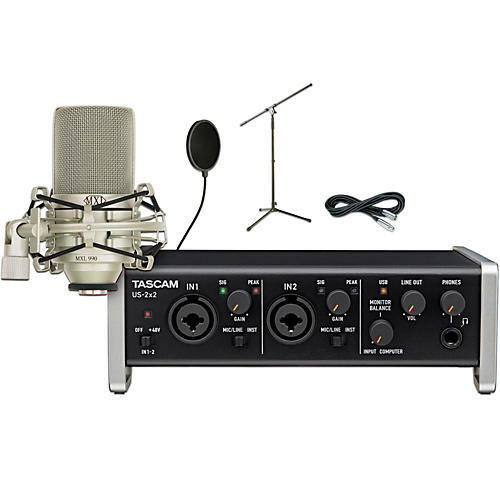 This package includes the Tascam US-2x2 USB audio interface, an MXL990 studio condenser mic, a 20' XLR mic cable, a tripod mic stand with fixed boom, and a 6" pop filter. A great start for home and project studios, or for mobile recording. TASCAM's US-2x2 features a new ergonomic design and some of the best audio specifications available for the ultimate 2-channel interface for home, project, and mobile studios. A pair of TASCAM's Ultra-HDDA mic/line preamps provide up to 57dB of gain with nearly inaudible noise and distortion specs. The audio design features high-performance, musical components like NE5532 op amps for rich sound quality without coloring the source. The MXL 990 Condenser Microphone with shock mount has a silky, sweet high end while retaining tight, solid low and midrange reproduction. The 3/4" gold-sputtered diaphragm creates a professional sound suited for digital and analog recording. Attractive vintage body style with champagne finish. The 30Hz-20kHz frequency response is ideal for lead and background vocal, male or female. Includes custom shock mount, mic stand adapter, and case. Remember folks, this mic requires phantom power, so make sure your console or interface delivers it before ordering.